So after playing around a bit more with my Margery Tyrell from Dark Sword, and being utterly frustrated after looking at her using my opti-visor (paint was chunky in places with some bits in it). Quite frustrating as from a distance, she looks great. I am undecided what I am going to do with her. She is so TINY. I like her as long as I don’t examine her really close-up. I think I may finish her up in the state she is in and call it a lesson. 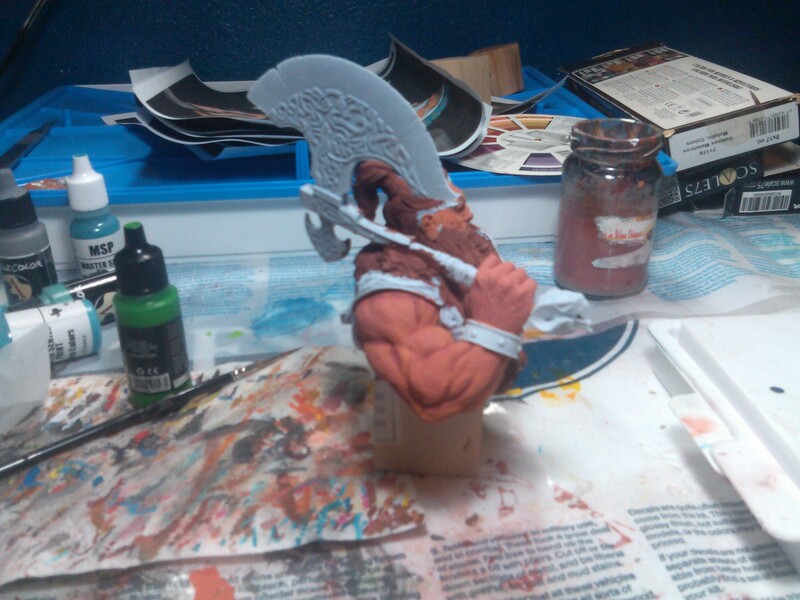 I started on Volkon last night. I based the the beard in Vajello burgundy. I am not sure where I am going with it other that I know it it will be brown. I am not sure where my highlights will go. Will it be a light brown or a red? Not sure yet. I should paint the hair first. I really should as it is the dominant feature on him, but I decided I wanted to work on a area to at least mostly finish if not finish, so I worked on the flesh. 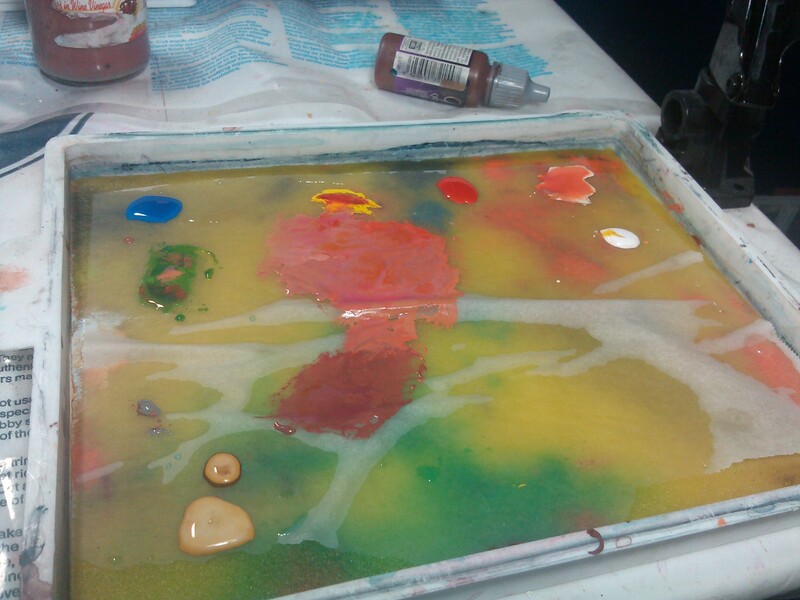 After Alfonso’s class, I decide to try making my own flesh-tone. This is after a bit darkening for a shadow tone, but it appears it may be a bit too orange. 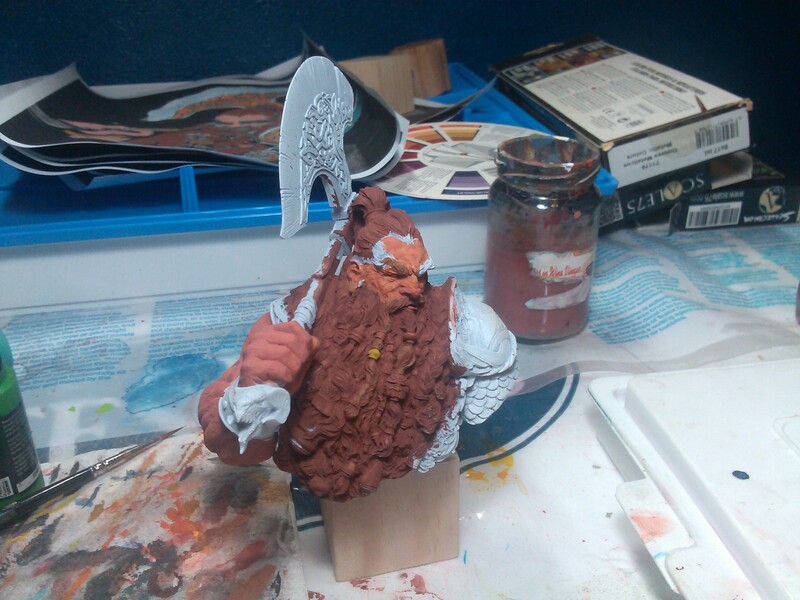 There is orange, white, green, yellow, and a bit a grey in that skintone (for the dwarfiness). It doesn’t look too bad, but it needs something yet. I am not sure. He has a long way to go, so I am not too concerned yet. Here is some pictures of what I have so far. I have blocked in some areas for a dark shadow with with a deep brown. For loving this model so much, I am quite lost where I want to take him. 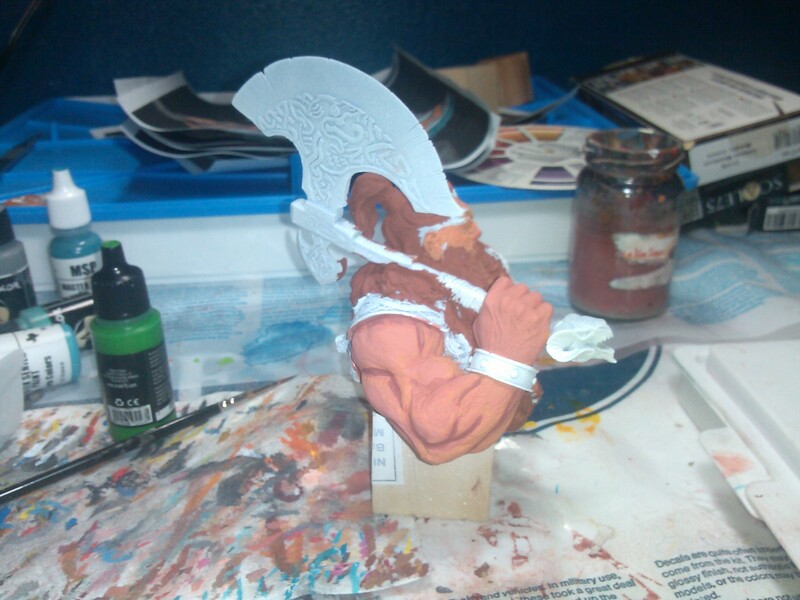 I am toying around with the idea of OSL on the left-side with the axe. I will have to see. I don’t think it really fits the model/dwarfs. It is too bad that the arm shots are bad. Here is another one that you can clearly see the blocking in of the shadow that I took with the flash accidentally on.